Studies have found that milling with an inclined plane when using ball-end milling cutters can reduce heating of the cutting tool. It has also been found that micro-textures on the rake face can play a role in the reduction of friction and wear. Taking these things together, milling titanium alloy with micro-textured ball-end milling cutters with workpieces at an inclined angle can have a significant influence on tool wear and the surface quality of machined workpieces. We have therefore looked at the factors affecting the quality of machined surfaces using an orthogonal test and, in particular, the effect of different micro-texture parameters and different workpiece inclination angles. Through means of an extreme difference analysis, the primary and secondary relationship between micro-texture parameters, workpiece inclination angles, and surface roughness is assessed. The analysis focuses in particular on the distance between micro-pits, micro-pit diameter, the workpiece inclination angle, the distance between the first row of micro-pits and the cutter edge, and the depth of the micro pits. 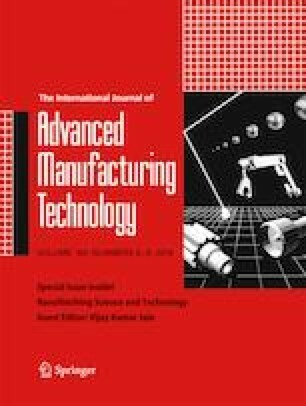 On the basis of the analysis, a model that can predict surface roughness is established that provides a means of optimizing micro-textured cutter design and machining inclination angles when milling titanium alloy. This study was financially supported by the National Nature Science Foundation of China (No. 51375126).